Today I’m excited to present a guest post from my friend Samantha Mills, who shares wonderful, vegan recipes on her blog, Novel Eats. Samantha was “raised a vegetarian by hippies,” and has been mostly vegan for the past five years. On the heels of October: Unprocessed, I’ve asked her to write about processed vegetarian & vegan convenience foods. Before I get to her post, though, I want to share my own veggie Thanksgiving story from when I was a teenager. Shortly after I became a vegetarian, my mom and I decided to try a “Tofurky Roast” in lieu of the traditional bird. The frozen Tofurky — essentially a fake-turkey kit — came in a nondescript, white cardboard box. If memory serves, we had to buy it at a specialty shop (or was it special-order?). Ever since that debacle, I’ve simply skipped the turkey while still enjoying my green bean casserole and sweet potatoes. 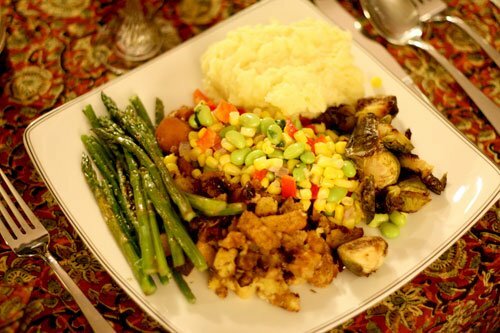 Mom still makes her vegetarian stuffing with toasted almonds, just for me, which is just one of the many gifts for which I’m thankful. When people, especially omnivores, discover that I grew up vegetarian, they almost always register a look of surprise on their faces. Even for vegans, it is unusual to meet someone like me who has never eaten a hot dog at a ball game or a turkey at Thanksgiving. They always wonder “what on earth” I ate when I was a kid, meaning “what did you eat instead of meat?”, especially since in the late 1970s and early 1980s there were not as many vegetarian-friendly processed foods as there are these days. Believe it or not, there were plenty of processed “meats” when I was growing up. Morningstar Farms, Worthington and Loma Linda were the choice brands to rely on for soy- and gluten-based foods. A few of my favorites were big franks (the vegetarian’s hot dog), prosage (a.k.a. veggie sausage) and scallops, the fake kind. Despite the amounts of processed proteins available to me when I was younger, we still tended to eat them more frequently on the weekends. In our house, these were special foods, not to be chowed down on all the time. For much of the rest of the time we ate homemade meals, and relied less on pre-packaged foods. When I learned of Andrew’s project, October: Unprocessed, I knew that he was tapping into an issue that exists for more than just omivores now. Today with the number of people choosing to follow vegetarian or vegan diets increasing, there is a greater demand for products that cater to these consumers. Most major grocery stores are stocked with not only fake meats, but also butter, mayonnaise, milk, cheese and ice cream that contain not a drop of real milk or a milk by-product. In short, people like me can easily follow a parallel diet to everyone else – but ironically, some of these similar, yet different products are often more processed. This begs the question, are those of us who do eat a lot of those products really that much healthier than omnivores? For the last five years I followed a primarily vegan, or plant-based, diet. I chose to restrict my diet further from vegetarianism (where I did eat honey, cheese and eggs) because of health reasons, so, ironically, you would think that with such a focus on being “healthier” I would actually be healthier. This is a common misconception, yet just because one eschews animal products does not mean that they are truly healthy. In some ways I was and have been healthier. I have said to myself and others time and again that my blog, Novel Eats, has made me an infinitely better cook. Not only can I make more delicious foods, I can also make much of it from scratch. I now make a lot of my own breads (including flat breads like tortillas), soups and fermented dishes. I also experiment with a wider variety of cuisines in my home because of my blog; no one wants to see the same recipes time and again (including myself), so I always am open to trying something new and thinking beyond my daily food staples. Despite being a better cook and enjoying good homemade foods more, in many ways I am guilty of relying too much on processed foods. It’s so easy to grab eight boxes of fake meat deli slices when they are on sale, then just randomly snack on them over the next couple of weeks. It’s faster to buy a case of soy milk rather than making my own almond milk at home. And how can I resist buying my favorite soy ice cream or vegan candy bar when they are just down that certain aisle at one of my local grocery stores? No matter who you are and what you eat, we are all now surrounded by a bounty of processed foods. Even raw foodists are not isolated any longer – they, too, have their raw energy bars and sugary dried fruits. It is easy to walk into a grocery store and feel both saddened and enabled to rely on processed foods for our daily sustenance. Yet I think that the crucial point to consider in all of this is that each of us has a choice to approach processed food in moderation, and not to allow ourselves to rely on it as our primary source of nutrition. When I am asked, “what on earth did you eat?” in response to finding out I grew up vegetarian, I immediately think back to my childhood days living next to my grandparents. My first reaction is not to respond with a list of store-bought fake meats, but rather to say that I grew up on food grown through tradition and love. I remember late summer days after my grandfather had harvested corn from the garden. We would sit on the back steps of the house, removing the husks and silk from each ear, then relinquishing the corn to my grandmother. She would cut the kernels away from the cob, creating creamed corn to store away for use during the winter months. With Thanksgiving near, usually a time of homemade dinners, reflection and appreciation, I again turn my mind back to those days and I recognize how fortunate I was. My grandparents, though not rich, were wealthy in good homemade food lining their freezers and pantry shelves. If we are each so lucky to have witnessed such a dedication to homemade foods, regardless of diet, then perhaps we can all approach processed foods through the lens of real food. We can then remind ourselves that the best food is found through a garden or farmer’s market, and created into something magical with a knife or whisk. I’m so glad you appreciate what your grandparents did and shared. I’m sure they would be proud of you, Samantha. Thanks for the comment, Tommie! It’s interesting, as I’m getting older, I’m also appreciating more and more the familial and cultural associations I have with food. It’s amazing how powerful that connection is!